Fossil fuel combustion in compression ignition engines, so fundamental to the worldwide economy, produces both NOx and PM emissions. Fortunately, there is a technology that reduces both. This technology can also increase fuel efficiency and thus decrease greenhouse gas emissions. The technology that can deliver this “triple-crown” of environmental and economic benefits is emulsified fuel technology (EFT). An emulsion is a mixture of two immiscible fluids. 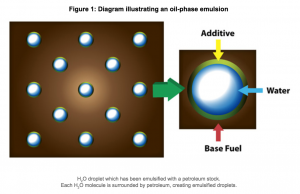 For example, oil phased emulsion features water droplets – the dispersed phase – uniformly distributed throughout the fuel oil – the continuous phase. An emulsion takes on the characteristics of the continuous phase. Hence, oil phased emulsions exhibit characteristics of fuel oil, not water. Emulsions are inherently unstable. Over time they will separate into the stable states of the dispersed and continuous phase materials. To maintain the composition of an emulsion, surface active agents, or “surfactants”, are incorporated into the production of an oil phased emulsion. In an oil phased emulsion, these surfactant agents encase the droplets of water distributed throughout the continuous oil phase and prevent the water droplets from coming together and coalescing. APT’s proprietary technology creates stable mixtures of emulsified fuels, which contain varying percentages of water content. The emulsion technology can be applied to bind various base fuels with water, creating a wide array of environmentally friendly products that reduce both oxides of nitrogen (NOx) and particulate matter (PM) pollution created during the combustion process. APT delivers its technology through a unique and intimate understanding of the critical components of emulsified fuel production as well as the combustion of emulsified fuels. APT has developed technologies and protocols for the manufacture of highly stable and cost effective fuel emulsions. The production of these emulsions involves the use of chemical additive packages, a mechanical blending process and the technical “know how”. The precise combination and application of these components produces fuel emulsions that are robust and stable, and are able to tolerate the enormous heat and pressure to which fuels are subjected prior to combustion in a diesel engine, furnace or boiler. The unique combustion characteristics of emulsified fuels only occur if the fuel remains an emulsion at the point of combustion. APT’s technologies reliably produce stable emulsified fuels of consistent quality and standard. APT Additives are a family of proprietary liquid formulations that chemically bind water and petroleum products together to form stable emulsions. APT Additives typically comprise from 0.5% to approximately 2% of the finished fuel. APT has developed separate additive combinations for diesel emulsions, fuel oil emulsions, emulsified biodiesel and residual oil emulsions. APT Additives are manufactured to APT’s standards by reputable chemical suppliers with international operations who can comply with APT’s strict requirements. The formulation of APT Additives is protected in some cases by patents and in others is the subject of trade secrets. APT Additives are liquids that are relatively inexpensive, easily transported, stored and applied. Generally, they have a very long shelf life (in some cases up to a year). Blending units required for the production of diesel oil emulsions, fuel oil emulsions, emulsified biodiesel and residual oil emulsions are vastly different in design and application. One feature common to these units is that they are relatively inexpensive, simple to manufacture, and operate with minimal service and maintenance requirements. APT Blending Units are manufactured to APT’s standards by reputable engineering companies with international operations who can comply to APT’s strict requirements. The APT Blending Units are protected in some cases by patents and trade secrets. APT Blending Units are generally automated, self-contained units that consist of a series of mixers, motors, pumps, meters and injectors, in which water, Base Fuel and APT Additive are processed. In producing emulsified fuel products, the APT Blending Unit computer measures, monitors and controls a variety of operating parameters, including temperatures, pressures, flow rates and motor variables. If any of the parameters vary from preset operational limits, an alarm will notify the operator. If a change is not made within a set period the unit will automatically cease production. To ensure consistent product quality, the operator has only limited access to operational parameters. Authorized APT personnel (controlled via password authentication) may make changes to operating parameters if needed. In addition, the control system allows remote access by APT to evaluate past operations, diagnose any problems and make changes if necessary. Residual Oil Emulsions – 189 barrels (7,900 gallons, 30,000 litres or 26 tonnes) per hour. The APT Technology was, and continues to be, a pioneer in the field of emulsified fuel technology. Over the last decade, APT has discovered much about the properties, combustion characteristics and handling requirements of emulsified fuels. The APT Technology includes numerous protocols and quality control standards for its products, ranging from raw materials, production, storage, delivery and use. Much of this know how was gained from extensive testing of products in diesel engines, combustion turbines, furnaces and steam boilers. Many of these tests were conducted in commercial environments at customer sites, independent laboratories, in-house and in the field. APT Emulsified Fuels are a blend of traditional liquid fuels such as diesel, naphtha, heavy fuel oil or Biodiesel and water. The water is present as droplets of microscopic size, distributed throughout the Base Fuel. This type of emulsion is known as an oil-phase emulsion. As a result, the finished emulsion has many of the physical characteristics of its Base Fuel (refer to Figure 1). In the case of water-phase fuels which have higher water content, such as ROE, the reverse is true and the Base Fuel is suspended as microscopic droplets in water. As a result the finished emulsion can have handling characteristics similar to water. APT Emulsified Fuels are manufactured from Base Fuels and water through the chemical bonding of APT Additives and by passing all three fluids through an APT Blending Unit. H2O droplet which has been emulsified with a petroleum stock. Each H2O molecule is surrounded by petroleum, creating emulsified droplets. While many are familiar with the phrase “oil and water don’t mix”, most don’t realize that the combustion of any hydrocarbon will produce a significant amount of water, in the form of steam, from the reaction of the hydrogen in the fuel and oxygen in the air. In fact, depending on the type of fuel, the water mass created during combustion can be greater than the mass of the fuel source. In other words, APT’s emulsified fuel technology is only altering the sequence in which the water is introduced into combustion, not introducing water as a new compound. The combustion reaction for methane illustrates this. Chemically, the combustion process consists of a reaction between methane and oxygen in the air. This chemical reaction results in the production of carbon dioxide (CO2), water (H2O) and a great deal of energy. The following reaction of methane (relative molecular mass of 16) yields two molecules of water on complete combustion with a total relative mass of 36 (molecular weight of water being 18). This example provides a simplified illustration, as typically other elements are present, such as nitrogen in the air and other constituents of the fuel. APT’s proprietary technology creates stable mixtures of emulsified fuels, which contain varying percentages of water content. The emulsion technology can be applied to bind various base fuels with water, creating a wide array of environmentally friendly products that reduce both NOx and PM pollution created during the combustion process. Emulsion technology is not new – and it works1 . It better atomizes fuel through the vaporization of water, allowing for a cooler and more complete combustion (refer to Figure 2 below). In diesel or biodiesel-based emulsions, sub-micron water particles are entrained in the petroleum through a high-shear blending process that employs an additive to molecularly bond the water and petroleum together in a stable emulsion. Emulsions are the only fuel technology that simultaneously reduces both NOx and particulate matter (PM) emissions. Thermal NOx is reduced because of the quenching effect of water and PM is reduced by the kinetic changes in combustion. It is the water content and stability of APT’s emulsified fuels that produce their unique combustion characteristics. For example, when a base fuel is sprayed into the combustion chamber (whether it is a diesel engine, a steam boiler or a furnace), it is atomized into droplets varying in size from 20 to 100 microns. Because only the surface of each fuel droplet exposed to air can burn, larger liquid fuel droplets do not burn completely, leaving unburned carbon to collect on the surfaces of a combustion chamber or escape as particulate matter in exhaust gases. This reduces overall thermal efficiency and increases harmful emissions (refer to Figure 3 below). 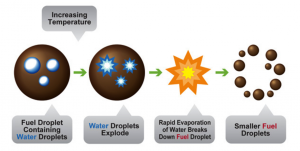 Unlike base fuels, when emulsified fuel droplets are sprayed into the combustion chamber, they are atomized a second time as a result of the violent transformation of their water content into steam. This transformation of water into steam shatters the petroleum surrounding that water into much smaller droplets (refer to Figure 4 below). Smaller droplets have a much greater surface area, significantly improving the efficiency of combustion. This unique combustion characteristic of emulsified fuels is commonly referred to as “secondary atomization”. A secondary effect of water transforming into steam is that peak combustion temperatures are reduced, resulting in the formation of significantly fewer smog-forming NOx emissions. The changes in combustion kinetics also significantly reduce PM emissions that result from incomplete combustion. APT is engaged in an active research and development program to broaden its portfolio of environmental solutions – developing advanced technologies to address the realities of increasingly stringent environmental regulations, pressures to reduce the carbon intensity of fuels in light of global climate change, and finite petroleum resources. APT is exploring other environmental related technologies that allow APT’s scientists to leverage their expertise in chemical, mechanical and combustion sciences. For example, within its chemical studies APT is exploring the application of its emulsion technology in the petrochemical industry where temporary emulsions could be used to accelerate chemical reactions such as oxidation. Within mechanical studies APT is exploring opportunities of physical modifications and improvements to engines and boilers to better respond to other alternative fuels such as biofuels. Within combustion studies APT is exploring how its understanding of the unique combusting properties of emulsions can apply to new generations of fuel additives. Finally, APT is also using its unique and talented team of scientists to evaluate other potential technologies that could become available under license type of agreements. Technologies being developed or considered include: oxidative desulfurization for light oils, solar power hydrogen generation and conversion to methane, a new generation of extended life batteries, and used engine oil recycling.